On the day that we all tend to stuff ourselves full of beer and hot dogs, I can't help thinking about a story I heard on NPR. It was one of those day in the life sort of pieces. Someone writes in and reads about a piece of their day. I wish I could find the link, because everyone needs to hear it. 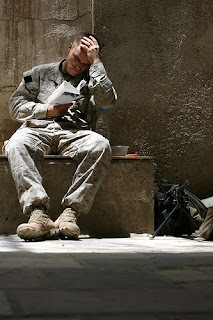 The reader was, with the permission of her patient, discussing her work with an Marine that had returned from Iraq. The young soldier had suffered through numerous attacks by the insurgency and one day her luck had finally run out. The soldier was severely wounded in a car bomb attack. After much painfully rehabilitation, the Marine was able to walk again and physically, short of a few scars, she looked ready to fight again. But she wasn't. She started to have flashbacks and anxiety attacks anytime she was in a public place. In Iraq, small children are used by the Taliban to lob grenades at soldiers. Nothing is safe or as it seems. Around every corner is a potential life threatening situation. The doctor continued to work with the soldier, gradually getting her to the point that she could go out into public places. But, after all of her work, she had been unable to walk past a row of cars. Physically, she would walk, but the visions of car bombs were still fresh in her mind and her anxiety went through the roof. The doctor gave the soldier the medical paperwork to allow the Marine to park in handicapped parking. The Marine was torn, did she use the pass, and have to deal with the glares of disapproval, a seemingly able bodied young woman walking from her vehicle? After hearing that story, I have learned to keep my judging stares to myself. I hope everyone can come home soon...safe.